We always celebrate Mother’s Day a day early as Hubby’s Mum works on a Sunday. As the sun was shining today, after a trip to the local Carvery, we went for a stroll to the beach to enjoy the sunshine. We almost had the stretch of beach to ourselves aside from a fisherman that disappeared not long after we arrived. I think we may have disturbed his peace! 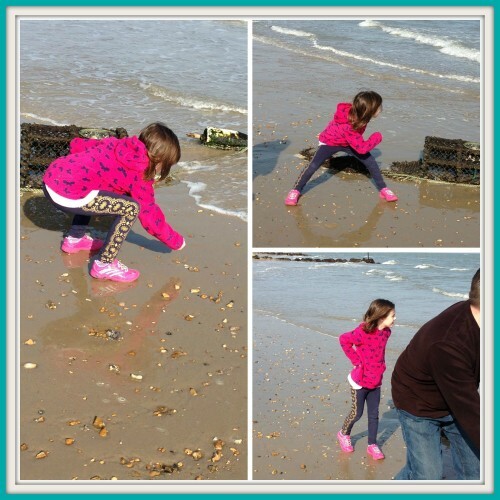 There was plenty of stone skimming, or dunking, and investigating worm tracks in the sand. The rocks were full of shells and seaweed embedded deeply into the surfaces. Even though the wind was quite strong, it was warm and sunny all afternoon. We finished off with a nice cup of tea before returning to the car on the land train. PS. Best of luck getting in the top 250 next month – so close!! I love beaches out of season – I am a failed sunbather! Sounds like a great idea celebrating a day early anyway, I bet it was a lot quieter! It’s great having the beach on your doorstep isn’t it, particularly this time of year when it is so quiet. The pictures are great, looks like a wonderful day at the beach and not too cold. Always so much nicer when the sun is out.